A Question from Katie Couric on Wednesday night illustrated how members of the media will use lack of majority support amongst whites for Barack Obama to raise potential racism. Citing a new CBS News/New York Times poll in which Obama leads McCain by 45 to 39 percent overall, Couric pointed out “it showed that John McCain had a slim lead over Barack Obama” (by 46 to 37 percent) with white voters so, she wondered: “Is there any way to determine if race is playing a role in those numbers at all?” She didn't mention how Obama leads McCain by a near-unanimous 89 to 2 percent amongst blacks. Jeff Greenfield undercut her premise: “I really don't think so. White voters have tended to vote Republican for the last 44 years.” The night before, July 15, Greenfield noted: “Obama does trail among whites by nine points, but remember John Kerry lost the white vote by nearly twice that margin in 2004.” And yet a day later Couric saw racism. 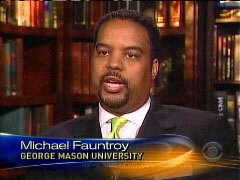 In Greenfield's Wednesday night CBS Evening News story, he featured liberal professor and blogger Michael Fauntroy, nephew of former DC federal delegate Walter Fauntroy, who contended John McCain spoke to the NAACP in order to appease “Republican moderates” who “do not feel comfortable being associated with a party that's known as hard right.” What “hard right” party? I wish there still was one. KATIE COURIC: In the presidential campaign, John McCain addressed the NAACP today, this as Americans remain deeply divided on the issue of race. In the latest CBS News/New York Times poll, 55 percent of whites believe race relations are good, but only 29 percent of blacks feel that way. More now from our senior political correspondent Jeff Greenfield. JEFF GREENFIELD: John McCain came to the most venerable black organization in America today with words of praise for the candidate he'll be trying to defeat. JOHN MCCAIN AT NAACP: Senator Obama has achieved a great thing for himself and his country, and I thank him for it. GREENFIELD: But when he talked about school choice and economic opportunity and conservative alternatives to liberal policies, was McCain really talking to black voters? Or was he talking to white voters who might be uneasy about voting against a black candidate? MICHAEL FAUNTROY, GEORGE MASON UNIVERSITY: Most of these moderate Republicans do not want to be associated, or rather, do not feel comfortable being associated with a party that's known as hard right. So McCain, in speaking to the NAACP, helps to take off some of the edge. GREENFIELD: And who was Barack Obama speaking to on Monday when he once again hit the theme of black responsibility? BARACK OBAMA: I know that nine little children didn't walk through a schoolhouse door in Little Rock so we could stand by and let our children drop out of school and turn to gangs for the support they're not getting elsewhere in the community. FAUNTROY: In speaking and using the tone that he has, I think what he really is doing is trying to reach out to independent white voters whom he has been leaking recently to say, listen, I'm not this scary black guy that you have to worry about. GREENFIELD: Now the idea that both candidates at an African-American event might be aiming at white voters, and our new poll that shows the sharp divisions between whites and blacks about the state of race relations, just more evidence, Katie, of how incredibly tangled this whole area of race and politics is. COURIC: And, Jeff, in our recent poll, it showed that John McCain had a slim lead over Barack Obama when it came to favorable ratings among white voters. Is there any way to determine if race is playing a role in those numbers at all? GREENFIELD: I really don't think so. White voters have tended to vote Republican for the last 44 years. So are we, is that a racial response or a partisan response? I don't think we know. Are white voters uneasy about Obama because of race or because he's relatively unknown compared to other nominees? Your guess is good as mine. 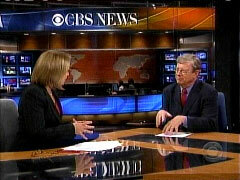 COURIC: I was going to say, hard to dig beneath those numbers. Jeff Greenfield. Jeff, thanks so much.